There’s just under six weeks until Christmas – have you started your Christmas shopping yet? Miffy has rounded up the best gifts to give adults this Christmas, including the new colourful Miffy Christmas jumper and a gorgeous pyjama gift set that’s great for giving to a friend. These gorgeous pastel PJs for grown-ups are one of Miffy’s favourites for Christmas! Snooze in style this season in a gorgeous peplum-style top and grey leggings – both adorned with Miffy designs – available from Next stores nationwide. 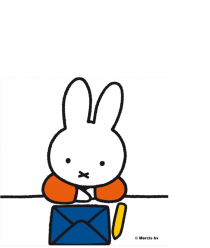 Announcing the NEW Miffy Christmas jumper! Enjoy Christmas jumper day (and every day until then) in this snug, retro, fair isle Miffy design exclusive to Truffle Shuffle. These super-stylish handmade crochet Melanie dolls are a great way to meet Miffy’s best friend! Choose from two designs, one in a snug winter hat and one in a stripy monochrome dress. These are always a favourite with craft lovers. This Miffy pyjama gift set is great for you or for a friend. Packaged in an adorable case, the PJs have a slogan that we can all agree on: ‘Wake me up when it’s summer’. Available in selected Primark stores. Give the gift of Miffy this year with these beautiful, luxurious Miffy face cushions! Available for a limited time, these special edition bunny cushions are adorable and look lovely in any room.